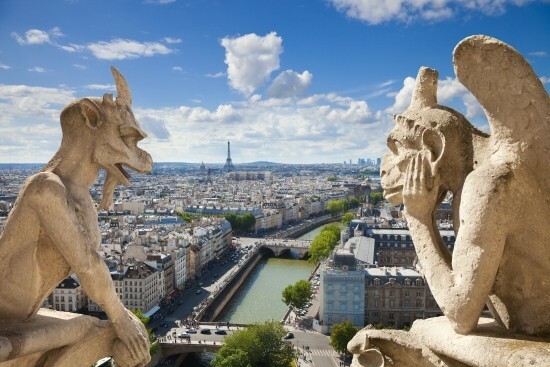 Notre-Dame Cathedral, located in the 4th arrondissement on the Île de la Cité, is the most visited monument in Paris, even more popular than the Eiffel Tower. This cathedral is not only known for its representation of French Gothic architecture, a style that commonly prevailed around the late medieval period, but also as the official seat for the Archbishop of Paris. Construction on Notre-Dame cathedral first began in 1163 and was completed by 1345, taking almost two centuries to build with the dedication of several bishops and architects. The cathedral holds one of the world’s largest organs and is known for its enormous church bells. Over the past centuries, the cathedral has been restored several times due to the damage it has encountered during the French Revolution and other periods of time. 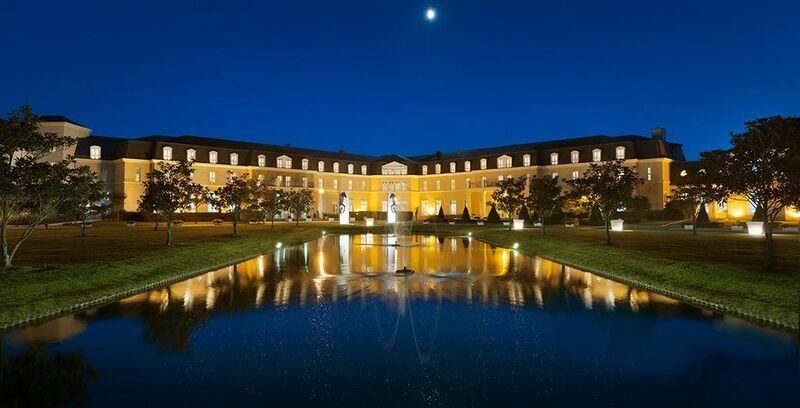 During the 17th and 18th centuries, under the reigns of Louis XIV and Louis XV, the church underwent renovations with the intent of modernizing architecture, a trend that was growing through Europe at the time. Prior to and during the French Revolution, many of the tombs, stained glass windows and statues were destroyed. Fun fact: During the French Revolution, the French people beheaded the statues on the façade of the cathedral, believing that they represented the kings of France instead of the biblical kings of Judah. Some of the heads were found in an excavation in 1977. Due to the damage that Notre-Dame Cathedral has faced since it was built, the Archaeological Crypt of Notre-Dame was created in 1965 in order to protect historical artifacts that can be dated to as early as the first settlements in Paris. These crypts are now managed by the Musée Carnavalet, where there are a range of exhibits, showcasing architecture from various time periods. The first official restoration of the Notre-Dame cathedral began in 1845, taking place over 25 years. This process was overseen by two architects, most notably, Eugène Viollet-le-Duc, and Jean-Baptiste-Antoine Lassus. Another restoration was initiated in 1991, in order to clean and preserve the sculptures and facades of the cathedral, rather than adding any new elements. This program continued restoring the cathedral until 2010. Entering the cathedral is free for everyone, but if you want an audio guide, you will have to pay for one at the entrance or the reception. It is a 35-minute guide that gives you a background about Notre-Dame’s history and architecture. In the summer, Notre-Dame offers free tours to learn about the cathedral’s history and architecture. These tours are offered on different days throughout the week in various languages, such as English, Spanish, and French. To find out more information about the tour, click here. During the events leading up to the crucifixion of Jesus, a crown of thorns was placed on Jesus’ head and is considered to be one of the Arma Christi or the Instruments of the Passion. Paris obtained The Crown of Thorns during the 13th century when Baldwin II, the Latin emperor of Constantinople, gave it to Louis IX in exchange for credit. This relic has been in Paris ever since. On the first Friday of the month, every Friday during Lent or on Good Friday, the relics “are presented to believers for veneration”. Other relics held by Notre-Dame include a part of the True Cross (carried by Jesus) and one of the Holy Nails (Jesus was crucified with). 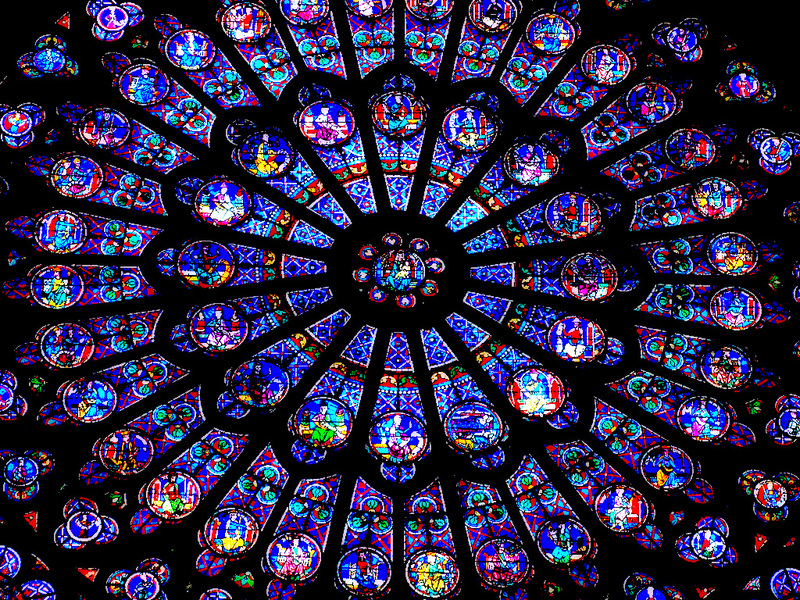 The number of bells in Notre-Dame has fluctuated. Originally, the church had 10 bells in total; however, during the French Revolution, 9 of the bells were removed. The cathedral’s most notable and largest bell, located in the South Tower, Emmanuel, dates from 1681 and weighs over 13 tons. Out of all the bells, Emmanuel is always rung first and is sounded during important events and holidays, such as Easter. During the 19th century, there were an additional 4 bells placed in the North Tower, which were recently removed as well, because they were deemed unfit. In 2013, 9 new bells were cast for the cathedral; one of which, Marie, rests with Emmanuel in the South Tower. Notre-Dame Cathedral carries so much history and information that you would not realize by just looking at it. Since its beginning, it has seen revolutions, wars, different priests, bishops and architects. It is definitely the place to visit in Paris, especially if you know the history behind the monument. Sainte Chapelle is a medieval chapel known for its 1,113 breathtaking stain glass windows and gothic architecture in the heart of Paris. Sainte Chapelle was built in 1239 for King Louis IX, also known as Saint Louis, to house his collection of the relics of Christ. Possessing these relics indicated to other kingdoms that Louis IX was the most powerful monarch in the Western world. Among the relics collected by Louis IX was Christ’s Crown of Thorns. Thus, Sainte Chapelle is a monument symbolic of French history and power, as well as the importance of Christianity during French medieval times. The history of Sainte Chapelle is interesting, but the stained glass on the second level of the chapel will leave you speechless. You will take a tiny staircase once inside the chapel that leads to the second floor. 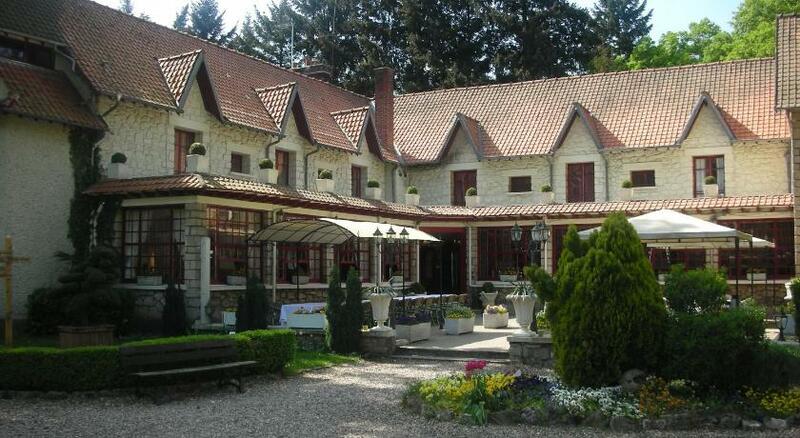 The second floor was used by King Louis IX while the first floor was used by members of the community. There are over 1,000 stained glass panels covering three sides of the chapel. Each panel is 15 meters high. 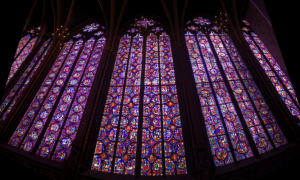 The windows tell biblical stories from the Old Testament and the New Testament up until the present day of Louis IX. Despite having been slightly damaged since their construction, they appear to be in mint condition to the everyday viewer. Aside from the famous stained glass windows that make Sainte Chapelle glisten like a jewel, you will see gothic rayonnant architecture at its finest. Windows, high pointed towers, and lacey imagery characterize the chapel’s exterior. On the inside of the chapel, rich colors decorate walls and beautiful arches will lead your eyes to the magnificent ceiling. Although Sainte Chapelle is the less famous church on the island of Île de la Cité, it offers visitors beautiful gothic architecture, immense stained glass windows, and an interesting history. 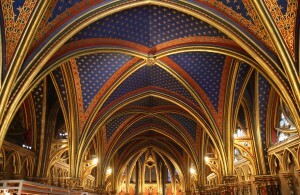 Don’t miss out on Sainte Chapelle! 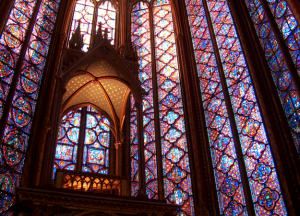 Sainte Chapelle is open daily from 9AM to 1PM. At 2:15PM, the chapel reopens until 5PM. Typically, there is a line to enter Sainte Chapelle. Since it is located right next to the Palais du Justice, their lines are right next to each other. While waiting, make sure you are in the right line for Sainte Chapelle. If you are taking the metro to Sainte Chapelle, you will take Line 4 and get off at the Cité stop. 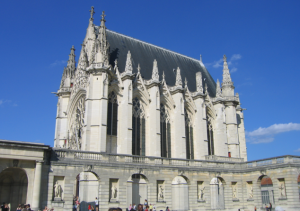 Sainte Chapelle is equally accessible by buses 21, 27, 38, 85 and 96, as well as the Balabus. For more specific route planning and transportation options, check out the RATP website. 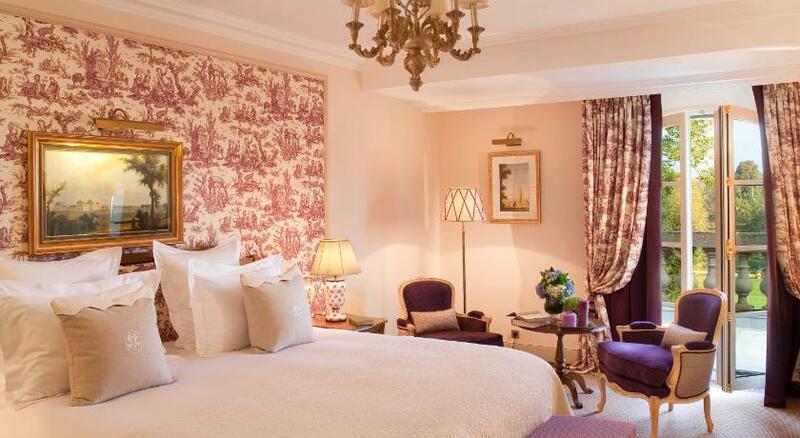 Check out these articles for more information on Paris main attractions.